Exposing the false interpretation of the Isin King Lists claiming dates of Sumerian kings 241,000 years before the flood. First Phoenician Dynasty of Uruas ("Ur-Nina") discovered as "First Erech Dynasty" of Isin King-Lists; and "Gilgamesh" or Gis'zax (Caxus) of Erech as father of Uruas' (Haryas'wa) and historical original of Hercules of the Phoenicians about 3150 BC. The new King-lists of the Isin period about 2050 B.C., recorded on a cuneiform clay "prism" in the Weld-Blundell Collection at Oxford, purport to give a complete list of the kings and dynasties of Mesopotamia with their regnal years extending back to 241,000 years "before the Flood." Professor Langdon on failing to find in this semi-fabulous list the names either of "Ur Nina" or any of his dynasty, or those of most of the famous Sumerian kings, including the great Gudea (Gadhi), who were the authors of by far the greater part of the innumerable monuments and records which make up Sumerian history, instead of remarking as one would expect on the apparent shortcomings of this list compiled by the credulous later priests of the insignificant Isin dynasty - a petty dynasty of reputedly alien origin, which appears after the devastating raid by Elam which destroyed the Ur Dynasty, and which has left no monuments but only a few inscribed bricks, two nails, and these king-lists - on the contrary he confidently accepts this Isin list as more authoritative than the actual contemporary records of the great kings themselves, and rejecting the latter declares that these kings were imposters in calling themselves " kings" and dynasties, merely because he could not flnd them in his Isin list. On scanning this Isin list, however, it appeared to me that not only were "Ur Nina" and his dynasty recorded therein, but that they were given the very first place in the list of human dynasties, where the supernatural ages end and the natural human ages begin. This observation was based on the general similarity in the form of several of the names, their relative order and number, and the point at which both dynasties end by war. And further examination completely confirmed this identity for all the names. In the annexed table I give the kings' names of this dynasty in question, which is represented as the "First Dynasty of Urug or Erech," alongside the names of the dynasty of Uruas' from their own monuments, for comparison. In column 1 are given the kings' names in the Isin list as revised by me, in column 2 the names as read by Professor Langdon, while in columns 3 and 4 are the names of the First Phoenician Dynasty, in my revision and that of Assyriologists respectively, and in column 5 the names from the Indian Epics and Vedas. It will be seen from columns 2 and 4 that the first-named king on the Isin list, Ur Nun-gal, suggests "Ur Nina" of the Phoenician list - Nin being as we have seen a Semitic dialectic variant of Nun, that the 4th Ennunnadanna suggests "Enannatum" the 4th in the Phoenician list, and the 7th and last Kiaga suggests "Prince Kagina," the 7th and last on the Phoenician list. On revising the spelling of the names on this Isin list, I found that the 1st reads "Uru-as' Nun-gal" or "Uruas' the great Fish," and thus obviously is a slightly variant synonym of Uruas'-the-KhadI (or Fishhous -Father), the founder of the First Phoenician dynasty. The 2nd reads "Ab-bi unu-ma" or "The Protector of Oxen (or Herdsman), the priest of the Land," and thus is clearly a title for Mudgala of the vast herds of kine on the Indus, and he is actually called" Lord of Cattle" in his Vedic hymn, he was also a high-priest and Vedic singer, and the 2nd of the Phoenician dynasty. The 3rd reads" La Bi-s'e er" or "The Pro�tector Bi-s'e, the hurrier or capturer," which is evidently a shortened title of Bi(d)as'nadi as the great conqueror, and the 3rd of that dynasty. The 4th, " In-nun-nad As'-na " was apparently In As'nadi the brother of the 3rd of the Lagash lists. The 5th, which is defaced, seems to read" Ta-ar-is-u," and so is a Semitic form of Tarsi, the 5th emperor of the Phoenician dynasty, omitting the two local rulers of Lagash (Entemena and In As'nadi II.). The 6th, Me-de-As'-na, is evidently the son and successor of the" divine Tarsi" (Divo-Dasa), named Mitrayu (Pali Mettiyo) in the Indian lists. The 7th "Lugal Kiaga" or "King Kiaga," is evidently "Prince Kagina" of the Lagash lists, and "King Cya-vana" of the Vedas and Indian Epics, the son of Mitrayu, and with whom the dynasty ended, just as it ends in the Isin list; and it is significant that this Cya-vana is specially called "king" in the Indian lists, just as Kiaga is in this Isin list. This full and complete agreement between these lists, in the names and titles and relative order clearly establishes the identity of the First Dynasty of Erech of the Isin list with the First Dynasty of the Phoenicians. And it shows that the Sumerians were in the habit, like the Ancient Egyptians, of calling their kings by different names and titles, as I had already observed from the comparison of the different versions, solar and lunar, of the Indian Epic lists. The coping stone to these proofs is now found in the discovery that the great epic hero and Hercules of the Chaldeans, "Gilgamesh" of the Semites or Gis'zax of the Sumerians - as my Indian lists show that the name was pronounced by the Sumerians - was the father' of Uruas' ("Ur Nina"), thus gaining for us for the first time the hitherto unknown historical character and date of "Gilgamesh," see his conventional portrait on seal of Sargon 1, Fig. 33. p. 47, and in the many other Figs. A, E, C, 30, 33, etc. The name of the father of Uruas' in this Isin list is read by Professor Langdon as" Gilgamesh." But on revising the spelling I find it reads" As' Gis'-zax ga-mes'" or "Lord Gis'zax the Buffalo (Fire) priest." There is no " Gil " or " Gibil " in the Sumerian spelling of this name though read so by that scholar; but the Sumerian Gis' is given in the glossaries the Semitic equivalent of "Gilgamesh." The use of ga for "buffalo" I have already established; and this title of "Buffalo-priest" now explains his usual association with buffaloes, such as his watering these animals (Fig. 33). and his wrestling with wild buffaloes as well as lions, as the Sumerian Hercules, and his wearing the buffalo head, skin, tail and hoof, as so freely figured on seals from the period of Uruas' downwards to the Assyrian period. Now in the Indian Epics the father of Haryas'wa is called" Caxus" (or Chakshus). with the epithet of "Arka." This "Caxus" is now seen to be evidently the Indian form of spelling the Sumerian "Gis'zax" when the writing was converted by the Aryans into alphabetic characters; and "Arha" is evidently dialectic for Urug or Erech, the modern Warka, the home of "Gilgamesh," and in series with 'Erakles. Thus" Gilgamesh" the Sumerian "Hercules," and father of the founder of the First Phoenician Dynasty, is now disclosed to be the historical human origininal of "Erakles " or "Hercules" of the Phoenicians, with fixed date as an Aryan Sumerian King of about 3150 B.C. Indeed his title 'Erak-les is now seen to be presumably coined from the name of his ancient capital city Erech, Uruk or Erek- -for the affix les, see later. Uruas' himself writes his father's name repeatedly on his monuments, as do also his descendants, as "Guni-tum, son of Gur-sar." Here "Guni-tum means "Dweller in the place of Fire" (or The Fire-wood brazier) that is a solar title of high-priest. And significantly his name Gis'zax has the Sumerian synonym of "Gunni" or "Wood-Fire brazier," which is spelt with the identical signs used by Uruas' in spelling his father's name, with the addition of the sign for long u and duplicated n.
Moreover, Gis'zax is given in the Isin list a title, which Professor Langdon translates as "whose father was a fool" Such a title, indeed, would be strange in a dynastic list, especially in regard to one of their greatest heroes, if it really existed. But the" fool" is merely that scholar's own introduction. The text reads clearly Ab-ba-ni zax la, and means "whose father was really Zax " - Zax or Sax or Sakh, being the common title for the Father-god Indra in the Vedas and Indian literature, where it is spelt Sahllo in Pali, and S'aMa in Sanskrit, whilst its Zax form, as I have shown in my former work, is evidently the Sumerian origin of the name "Zeus" of the Greeks. My reading is made absolutely certain by the continuation of that sentence in the Isin list, which is read by that scholar as "The Lord of Kullab," but which reads unequivocally "Of the seed of the Lord, Father Zax [himself]." Still further proof of the identity of this portion of the Isin list with the First Phoenician Dynasty and their ancestors is found in the identity in the name of the father (or predecessor) of Gis'zax (or "Gilgamesh") in both the Isin and Indian lists. In the Isin list his name and title is translated by the professor as "The deified Dumuzi, a fisherman." I read it ?. As' Damuzi s'u-pur," or" Lord Damuzi of the hand-bowl (Pur)." This apparently correlates the famous magic divining bowl or cauldron of the original Damuzi or Tamuz, with the divining bowl of his later namesake, this" Tamuz," the grandfather of Uruas'. Now in the Indian lists the father of Caxus (i.e., " Gilgamesh ") is named Puru-janu, or "The receptacle of production (or creation)," wherein Puru or "receptacle" appears to represent the Sumerian Pur "bowl" in the Isin title. But another version of the Indian lists actually gives "Tamas of the Deep" (Dirgha Tamas, the seer already described in the text), as the grandfather of Haryas'wa (Uruas'), thus giving him the literal equivalent name of the Sumerian "Damuzi" or Tamuz. It is thus probable that the identity of the Isin and Indian lists may proceed still further back when examined, and that in the former the names up to "The Flood" may prove to be those (or titles) of traditional Aryan or Sumerian kings, to whom fabulous ages have been assigned. But, be this as it may, the fact remains that our new evidence has proved up to the hilt the identity of the human portion of the First Dynasty of Erech of the Isin lists with the First Dynasty of the Phoenicians founded by Uruas', and its Aryan racial character. 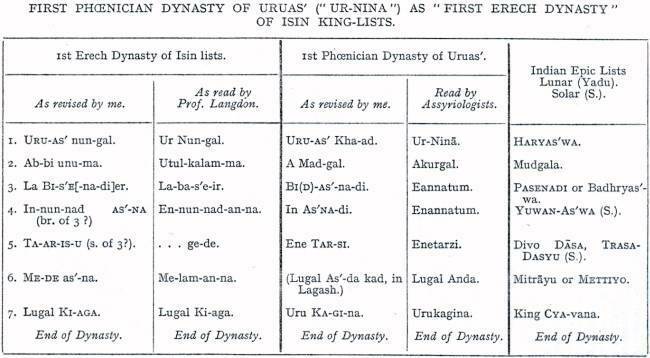 The location of King Uruas' (or "Ur Nina") and his dynasty at Uruk or Erech by the Isin lists, and not at "Lagash," although against the narrow current theories of Assyriologists, is quite in keeping with the new facts we have elicited regarding the imperial character of the dynasty of Uruas'. Thus the grandson of Uruas' is known from the excavated monuments as "King of Kish," the chief capital of Upper Mesopotamia, and as "Emperor of the totality of the Lands," specifying Opis, Elam, S'akh (Indus Valley), etc" etc. ; and his son Tarsi was still "King of Kish" and patesi or high-priest of Lagash and victor over Elam. Uruas' himself is, as yet, merely known through the local excavations at his seaport as "King of Lagash" with influence over Eridu, another port to the west; but we have found that he was also "King of Edin " in the Indus Valley. Now, however, in view of his being the son and successor of King Gis'zax (or "Gilgamesh") of Uruk, the "Caxus or Arka" of the Indian lists, he was doubtless also king of Uruk, the earliest seaport of Mesopotamia, at the modern Warka about 30 miles west of Lagash, and presumably silted up at his epoch, necessitating a new open port such as Lagash. The vast mounds of ruins at Uruk or "Erech," the vastest in all Mesopotamia, are not yet excavated, and their excavation has not yet even been begun, except some superficial" scratching" on a spot by Mr Loftus. When the ruins of this ancient city of Uruk or Erech, now disclosed to have been the capital of Hercules of the Phoenicians, are explored in all probability there will be found records of Uruas' (Haryas'wa) designating him "King of Uruk"
This new evidence thus conclusively establishes the fact that the greatest of the Early Sumerian Dynasties, that of Uruas' or "Ur Nina" - pace Professors Langdon and Sayce - was racially Aryan and "Phoenician" ; that the father of King Uruas' was the actual historical human original of Hercules-the-Phoenician, the "Gilgamesh" or "Fire-priest" of the Semitic Chaldeans, with relatively fixed date of 3150-3100 B.C., with his capital at Erech; and that this discovery that the Phoenicians were the leading seafaring branch of the Early Sumerians or Aryans, fully confirms the mass of evidence from entirely different sources detailed in my former work, proving that the Phoenicians were the Aryan blood-ancestors and the authors of the civilization not only of the Indo-Aryans, but of the Britons and other Phoenician nations in Europe.